A team of Iranian and Italian archaeologists has unearthed ruins of an ancient temple in an Elymais site in the Kaleh Chendar region in southwestern Iran, the Iranian director of the team announced on Saturday. Vito Messina of the University of Turin and a number of his colleagues accompanied the team during the excavation intended to gather information about the Elymais period, about which little is known in Iranian history, he stated. According to Britannica, Elymais was an ancient Parthian vassal state located east of the lower Tigris River and usually considered part of the larger district of Susiana. It incorporated much of the area of the biblical region of Elam, approximately equivalent to the modern region of Khuzestan, Iran. Though the capital city of Susa belonged to Elymais, it seems to have been administered by a Persian satrap. The heart of the kingdom centered near the mountains of Lorestan near modern Behbehan and Izeh, where the local dynasty left rock reliefs and inscriptions in a form of Aramaic. The dynasty seems to have been founded by Kamnaskires, known from coins dated 81 BC. The kingdom, though seldom mentioned, survived until its extinction by the Sassanid king Ardashir I (reigned 224–241 CE). The Iranian-Italian team dug six trenches at the site located near the village of Shami, Mehrkian said. 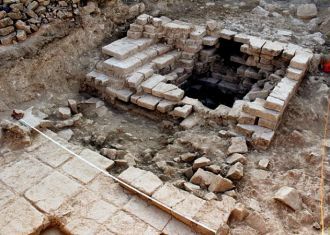 “A structure entirely built from rectangular bricks was uncovered in the third trench… A member of the team says that it was an altar or a small platform for worship,” he added. The first trench was dug in a spot that had first been excavated by Polish-born British archaeologist A. Stein about 77 years ago during his project “Old Routes of Western Iran”. The life-size bronze figure of a Parthian prince, which is on display at the National Museum of Iran, is surmised to have been discovered at this site. In the sixth trench, the archaeologists have discovered an ancient family grave which was used by members of a family for about one hundred years during the period. “This tomb represents a style of burial. It is a small rectangular room with a stone structure,” Mehrkian stated.